I’ve written about changes I made to my apartment after Ben passed away. The painting and recarpeting had to be done- the ALS battle scars were so huge. There are things I’ve displayed and put on the walls that remind me of him and of us and I love to be surrounded by these things and memories. But then there was his table, the ugly table he used as a desk that even he didn’t like. I thought it would be easy to replace it, and I picked a little dining table that I was excited about. But, when I started to think about not having his table anymore, it was very emotional for me. I decided to keep it and use it for baking, because Ben would love that. To read my post about what happened to that table, and things that matter, click here. I have been looking for dining chairs since I got the new dining table. Imagine my delight when Ethan Allen launched its Disney line (click here to visit the site)! 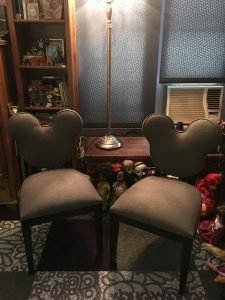 I fell in love with the Mickey Mouse dining chairs and had to order them. I thought about replacing Ben’s desk chair, because the foam on the arms is completely falling apart and it is not as sturdy as it used to be. That chair holds many memories, some good and some bad. I sit in it every day and remember how that chair functioned as Ben’s desk chair and, also, as his wheelchair, because it was narrower than a wheelchair and could get through the narrow doorway to the bedroom. I dragged the rolling chair to and from the bedroom every day. I transferred him from that chair a few times a day. We always worried that it would collapse, and thank goodness it never did. He sat in that chair all day. I fed him meals, shaved him and we watched tv and had our conversations while he was in that chair. I still find myself looking at the chair and talking to Ben when I need some kind of an answer or sign from him. The thought of not having the chair here made me cry. The chair is staying. The memories, good and bad, and the smiles and tears, are part of what our life was with ALS, and it all matters. The chairs arrived on Saturday. They are beautiful. Ben would love them. But, right now I am coexisting with them. They don’t quite belong yet. It’s like the holiday ornaments I purchased when I went to London in October (click here for more about that.) I tried to create the tree exactly as Ben and I had it, with our ornaments in precisely the places where Ben liked them because he could see them from his desk. The new ones were jarring. Now, these chairs are jarring. It’s hard to enjoy them completely without Ben. I know in my heart that he would be happy for me. But, he’s not here to enjoy them with me, so it’s kind of bittersweet. I know that I have to create new memories in my home. I still struggle with that. I hope that my friends will visit and enjoy the chairs and meals that I will prepare. And, as we look around the apartment, I do hope that they will also feel and celebrate Ben’s presence. As I find new ways to relate to Ben, I know and take comfort in that he will always remain a part of everything I do. I always picture Ben like this, in his chair at his desk. The chair stays! 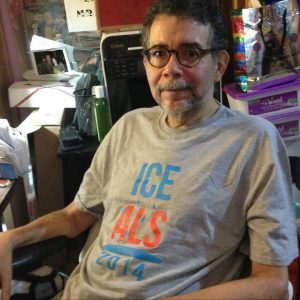 ALS Awareness Month- Never Lose Hope	Happy Birthday, Donald Duck! And, Thank You! The last line of your post is key: Ben will always remain a part of everything that you do. His presence with you is in a new dimension, but he is there! Thank you, Maureen. Sometimes it’s hard, and it’s not enough, but I agree that he’s here with me, just in a new way.